Hey everyone! Hope you all had a wonderful weekend, even though I am sure it didn't last long enough! Today I am bringing you guys a selection of Milani Nail Lacquers. Orchidia is a really pretty purple with a silver shimmer running through it. I am a sucker for this sort of shimmer so I really love this one. The application was fairly simple, and I needed two coats. Juno is a pale pink cream polish. To me, there is nothing stand-out about this polish, though I am admittedly not a pink fan by any means...especially not light ones. I needed about 3 coats for this polish, so it was kind of on the sheer side. Beach Front is a gorgeous light blue with silver shimmer running throughout. The application was perfect in two coats. Sail Away is the third polish in this grouping with the fine silver shimmer. I really love this one. It was incredibly opaque and easy to apply. I used two coats, though I could have gotten away with just one if I needed to. Silver Stilettos is a great silver polish. It isn't necessarily unique if you already own a silver of this sort, but if you don't already own one, this wouldn't be a bad choice. I used two coats for the above picture. Mint Candy is not your typical "mint" polish. It's a much more teal/green than most of the other mint polishes in my collection. 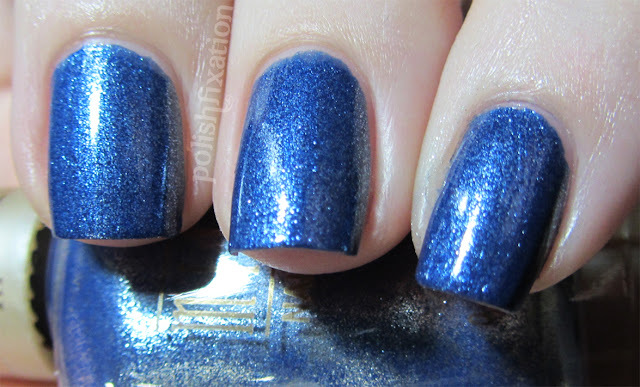 I really like this one, and I love the fine shimmer it has. The only thing that could have made this a better polish would be if I'd only needed 2 coats for full coverage, but I did need three. But that is a small price to pay for a polish this pretty. Overall I am pleased so far with the Milani polishes that have been released recently. I will have more to share with you very soon. Milani Lacquers retail for $4.49/ea and can be purchsed online or in drug stores. I love love love Orchidia and Mint Candy. Super pretty!! They are all beautiful!! I need to pick up Mint Candy! Pretty - I need to try some Milani polishes one of these days. Milani is one of my favorite brands, I love these colors! You may be able to get them cheaper on beautyjoint.com. Also I love teals >_< I'm gonna have to look into that one. I love Milani polishes... they're so in-expensive and such pretty colors!